CHECK OUT THE CATALOG BELOW! ​GuitarSounds 18 albums (cd's and downloads) are available at Amazon, CD baby, itunes and Spotify. From solo guitar, duos, trio, quartet, quintet and our full six piece band we invite you to explore a wide variety of instrumental styles centered around the guitar. Our music is very eclectic which includes classical guitar, contemporary and pop/rock acoustic, nuevo flamenco, Latin jazz, Latin rock, jazz standards to a variety of world music styles. Enjoy checking the following collections of albums including the THE BAND SOUND, THE ACOUSTIC CLASSICS and the SOLO GUITAR COLLECTION. Below you will find a description of each album and a link where you can review the playlists, listen to and or purchase the music. If you are listening to our music and are considering booking us for an event or concert we suggest using the itunes links below for easiest listening. You do not have to have an itunes account to listen. Just hover over the name of the song and the play option comes up. These first six albums represent different eras of The Peter Pupping Band from their beginning as a quartet to a six piece group. ​The “Jazz bEnd ” release explores funky rhythms and some crunchy and smooth guitar for an interesting blend of rock-funk influence on a variety of material. Drawing from rock, pop, funk, Latin, blues, jazz standards and smooth jazz the new release blends the boundaries of rock and jazz styles with covers from artists like Miles Davis, Antonio Carlos Jobim, Jaco Pastorius, Jimi Hendrix, Led Zeppelin, Sting, Joe Cocker, Billy Preston and an original by Pupping the “Pleasant Groove Blues”. The band’s new CD release called “Jazz Bend” brings together four music veterans who bring their rock, blues, jazz and classical backgrounds for a tour de force album. The San Diego Band features recording artist and band leader Peter Pupping on guitar who brings 30+ years experience performing, recording and producing 18 albums to the collaboration. Recording artists Mark Hunter, electric bass guitar and Kevin Koch on drums and Allan Phillips from the world renowned band Fattburger bring a funky, rock, jazz groove that is unmistakable and harkens to their many years of experience in straight ahead, funk and smooth jazz genres. 2 THUMBS UP. I only give it two thumbs up because I only HAVE 2 thumbs. One thousand thumbs would be dumming it down! Café Pacifico is a great listen for relaxation, dance and reflection. The music explores various Latin styles from around the world including Bossa Nova, Samba, West African, Cuban, Andean, Nuevo Flamenco, Nuevo Tango and Latin smooth jazz. Reggae, and Latin rock transporting us to a paradise made for your favorite island fantasy. Journey to a vacation paradise as you listen to the Latin, Jazz, Calypso and World sounds of Embarcadero. This album debuts five originals and also covers Carlos Santana's El Farol, a jazzy rendition of Jose Feliciano's Affirmation, Brazilian composer Antonio Carlos Jobim's One Note Samba and Felicidade, a famous Spanish love song Besame Mucho and a variety of traditional Latin songs from many parts of the world. 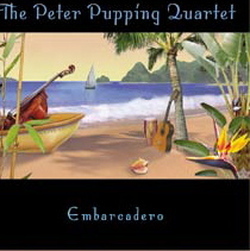 A collection of great hits from Samba, Nuevo Flamenco, Bossa Nova and Jazz styles performed by The Peter Pupping Quartet. The songs range from the rhythmically festive to easy listening romantic pieces. If you enjoy Ottmar Liebert or the Gypsy Kings you will want to add this album to your collection. Peter Pupping’s first original work Where It Started reflects on the early years of his love for music up to the present. Presented here are ten originals and two cover songs Lean on Me and Listen to the Music. Peter's original works draws from nuevo flamenco, smooth jazz, island, contemporary acoustic, blues, gospel, Latin jazz, samba, world music and rock styles. The inspiration behind the original works reflects some of Peter’s great loves. On “Claire’s Dance” the music reflects the Hawaiian slack key style, a happy tune with joyful spirit. In “Navajo” Peter merges a love for world music with Latin jazz as the Indian flute appears and brings a merger between the Americas. On “Samba 2 Carlos” Peter echoes a love for two great musicians/composers Antonio Carlos Jobim and Carlos Santana. On this piece the bossa nova inspired by Jobim meets Latin rock and Peter pulls out all the stops on an electric guitar solo in tribute to Carlos Santana. “Land Ho” a joyful song suggesting the feeling of seeing land after weeks at sea on a beautiful sunny day as suggested by the merger of island sounds and flamenco guitar. For this project Peter pulled out an arsenal of guitars including the Spanish guitar, electric guitar, 12 string, baritone guitar and acoustic six string. In the company of five guest artists Mark Hunter on bass, Allan Phillips on keyboards, bass and percussion, Kevin Koch on drums, Jeff Basile on double bass and John Rekevics on Indian flutes this album sizzles with excitement, precision and good vibes. ACOUSTIC GUITAR CLASSICS 4 VOLUME SERIES represents a guitar duo instrumental collection of the most popular pop rock groups and artists that came out of the 60's and 70's including The Beatles, James Taylor, Simon and Garfunkel, Elton John, Billy Joel, The Eagles to name a few. Learn more about the 4 volume series below. You will also find links to audio samples. Besides listing the Acoustic Guitar Classic Series here we have created a site entirely devoted to the Acoustic Guitar Classics Series. There you will find videos and more background information about this series. Acoustic hits of the 60's and 70's creatively arranged for instrumental guitar. "Here Comes the Sun" includes favorites from the Beatles, Simon & Garfunkel, Cat Stevens, James Taylor and more. A sequel to "Here Comes the Sun". "Morning Has Broken" continues the theme of acoustic hits of the 60's and 70's specially arranged for two guitars. Morning Has Broken includes more favorites from the Beatles, Simon & Garfunkel, Cat Stevens, James Taylor, Jim Croce, Neil Diamond, Kenny Loggins, Billy Joel and Van Morrison. If you loved "Here Comes the Sun" and "Morning Has Broken" you will die for "Moondance" which once again visits more great acoustic singer/songwriter classics by the likes of the Beatles, James Taylor, Simon and Garfunkel and a toe tapping version of Van Morrison's Moondance. All the songs are arranged as guitar instrumentals with an occasional guest instrument. This album completes our collection of the most well known songs of the boomer era. Good Day Sunshine captures the soothing flavor of the past three titles and adds energy with songs like Van Morrison’s Brown Eyed Girl, the Beatles' From Me to You, Sgt. Peppers Lonely Hearts Club Band and Led Zepplin’s Stairway to Heaven. Enjoy Emerson, Lake and Palmer’s From the Beginning, The Allman Bros’ Little Martha, James Taylor’s Country Road and the Eagle’s Hotel California. set. Also, we added two unreleased tracks Honey Pie and Do You Want to Know Secret. THE SOLO GUITAR SIX ALBUM SERIES highlights the solo recordings of Peter Pupping and William Wilson. 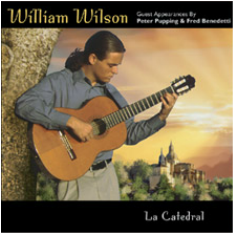 William appears as a guest on Peter's Christmas album Gloria, An Acoustic Guitar Christmas, and Peter appears on Williams first release La Catedral. Saturday Morning - Peter Pupping - A soothing instrumental guitar experience! ​People often ask me “what I like to play for fun?” For many years I’ve often sat around the Saturday morning breakfast table with my wife and kids improvising on my guitar just for fun. Whatever came to me I would play between conversation, coffee and the smell of breakfast being prepared. One Saturday morning my youngest son Hans asked if I could record an album with the music I play on Saturday mornings. To translate, that means improvisations with my most beloved Lowden acoustic steel string guitar which was made in Ireland (a very soulfull guitar) and my Giannini Brazilian nylon string guitar (my daughter’s favorite). Typically I would wander through various musical styles from new age sounding “chordscapes” to musings with traditional American and Western folk songs, Blues, Latin and lots of other ethnic music. I have written all the music with all of the above influences in mind. For this recording I assembled a unique group of guitars like an Oribe steel string classical guitar, a Moog electric guitar, an electric sitar guitar, an octave guitar and not mention a couple of beautiful Spanish guitars. In addition, I haven't made it too public that I play the Native American Indian flute which appears on the the the song "Desert Miner". My goal was to write music that relaxes but doesn't bore, comforts without sadness and has a lift to it! La Catedral captures both the vibrant fire and the serene calm of the Latin soul. From the Jungles of Uruguay to the Castles of Seville, this music explores the magic of Spain and the Americas in arrangements for guitar and various South American instruments. William collaborates with Fred Benedetti on a guitar duo arrangement of the Adagio from Rodrigo's Concierto de Aranjuez as well as Peter Pupping playing Tres Cubano for Antonio Lauro's Venezuelan Waltzes. Also included is William Wilson's haunting Compuncion with Jay Easton on Great Bass Recorder. The intimacy of the solo guitar selections and the tender appeal of the duo arrangements is sure to inspire. A superb presentation of the serene and peaceful aspect of the classic guitar includes Renaissance, Irish, Baroque, Spanish, South American, Classical and Romantic music that merges the classical and folk music worlds. The Spanish mission setting on the cover visually sets the tone for this soothing, purely acoustic collection by guitarist Peter Pupping that is sure to soothe the soul. Thank you for your fine music. I was given your CD album Guitarra de Paz 25 years ago as a gift, when I lived in Encinitas. It is music most satisfying. Among the hundreds of other albums, I have only several that have consistently brought me pleasure over the years, and yours is among those cherished few. The music of solitude reflecting the great fields of Argentina, the Pampas, this is the legacy of the lone gaucho. There is sadness, yet peace. There is emptiness, yet hope. In Tango for One William Wilson shows another picture of Tango and the music of Argentina. Not the showy manufactured passion of so much Tango, but rather a side not seen by most. Here there is desperation and loneliness. Wilson states, "Beneath ﻿the﻿ glitter and fast movement of the dancers often there exists a soul that is in great longing for beauty and goodness; a soul that I saw in my childhood from my Argentine mother. It is this yearning that I have tried to capture." This recording presents a diversity of sacred music including traditional American, English and Irish Hymns, Spirituals, Gregorian Chant, Renaissance and Baroque music. Variety and texture is added through the use of both classical and steel string guitar, Renaissance lute, a sparing amount of bass guitar and the Chapman stick. Among the 20 tracks includes J.S. Bach’s Chorales performed on lute, the famous American hymn Just As I Am, a Gregorian chant for guitar with a piece titled Parce Domine, the traditional Irish hymn Be Thou My Vision, and the very famous spiritual Were You There. The intent of this music was to create an atmosphere of comfort, strength, joy, prayer and reflection. A unique Christmas collection for classic and steel string guitar including traditional favorites, unusual and beautiful carols, Renaissance and Baroque pieces. Includes: Carol of the Bells, What Child is This, Away in a Manger and many others. Flute, bass flute, and percussion make their appearance on several arrangements. Additionaly we added two vocal soprano selections on What Child is This and Pat a Pan wonderfully performed by Katherine Pupping. Gloria! celebrates the beauty and mystery of Christmas.